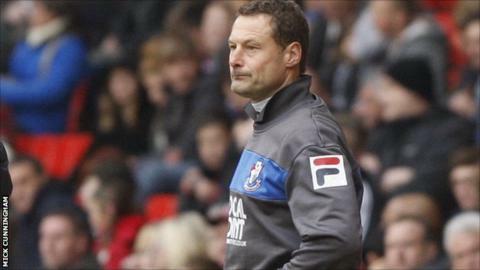 Paul Groves has been named manager of Bournemouth on a permanent basis. Groves, 46, was appointed caretaker boss in March following Lee Bradbury's departure after 14 months in charge. The ex-Grimsby Town manager, who will continue to be assisted by Shaun Brooks, won only two of eight games but believes he can bring success and a change of style to Dean Court. "I am confident we can get the team to play in such a way the fans enjoy," Groves told BBC Radio Solent. Bournemouth chairman and co-owner Eddie Mitchell admitted last month that Groves was his number one choice for the job, and he has moved quickly to appoint him. Groves and Brooks have been handed two-year contracts to run the first team, after being promoted from within Dean Court. Some fans have claimed the pair will just do Mitchell's bidding, a suggestion Groves was quick to refute. "I think we are far from being yes men," Groves told BBC Radio Solent. "We are very strong, opinionated football people and if we feel that there is a strong case for our opinion to be voiced, then make no mistake we will do that and we will be vigorous with regards to our opinion. "When it comes to the football side we will make our views known...(but) he is a very bright, intelligent businessman who has done very well so you have to listen to his opinion. "At the end of the day I will make the final say when it comes to football. We have discussed it and everybody knows where they stand." For Groves, it is his first managerial appointment since leaving Grimsby eight years ago, but he does not see that gap as an issue. In that time Groves has coached at Portsmouth as well as been youth-team boss at the Cherries and feels he is ready to return to senior management. "I recognised that after that period, I needed to go and gain experience, I needed to learn my trade from that point of view and I feel I have gone some way to doing that," he added.